Dear Danielle: We Loathe the Virtual Assistant Term. Is There Something Else We Can Call Ourselves? Hey Danielle! Happy New Year!! Ooo, I love this question. Good to hear that you all detest it as well, lol. So funny. But yeah, it’s such a counterproductive term for those who are trying to build real businesses with well-paying clients who take them seriously. When you say consultants are not viewed very favorably, it sounds like the same sentiment the general population over here has about them. Sort of along the lines of how people in general feel about attorneys. Attorney and consultant jokes abound and “everyone” hates them… until they need one, that is. As a new industry, it’s helpful for us inside that industry to have one unifying term so that we can easily find our peers to create community. However, when it comes to clients, you market with a message, not a term. You want your message to be all about the client, what you do for him, and how you help improve his business and life. What you call yourself comes after all that, simply for the purpose of giving people something to call you and categorize your business with—a mental coathook, if you will—which is very important. Psychologically, people just need that in order for there to be understanding. At the same time, you want your term to be one that isn’t fraught with all the wrong connotations, that doesn’t create negative, problematic perceptions, expectations, and understandings (like the VA term does) or it will defeat your purposes and make working together more difficult. As I always say, when you run a business, you aren’t anyone’s assistant. Assistant is a term of employment, and when people think you are an assistant, they want to pay and treat you like one. Their perception—due to that term—is that you are a subordinate order taker, not a peer, expert and trusted advisor. The other important thing is that you aren’t marketing to the general population so it doesn’t matter what their general opinion is of certain words/vocations. You are marketing to business people who have a need for the solution you’re in business to provide. With a proper marketing message educating them about what you do and how you help them, they will understand the benefit and value of working with you in the same way that the clients of attorneys and consultants understand why they need them. If everyone truly had very little opinion or need of attorneys and consultants, they wouldn’t exist. And, like I say, general opinion is simply irrelevant in our context. I see conversations here and there where it’s clear some folks in our industry don’t understand our use of the term “consultant.” They think all consultants do is advise. We use the term “consultant” in a hybrid sense of the word, not the traditional definition. So what I explain to peers and prospects is that while I am first and foremost an administrative implementer providing support, as an administrative expert I’m also in a position to give clients guidance and advice on their administrative systems, set-ups, tools and organization. That’s the advisor part of it. Hence: Administrative + Consultant. See? One other thought to add… you also want to make sure you aren’t focusing solely on the “consultant” aspect. Because we aren’t consultants in that sense. They are completely missing the administrative part which is THE most important information to relate, not the consultant part. Those folks are the ones who are going to confuse their audience and make people think they are something they aren’t. So you don’t want to use just “consulting.” You need to include “administrative” in there to provide the proper context and understanding. Otherwise, people will be confused and get the wrong idea. 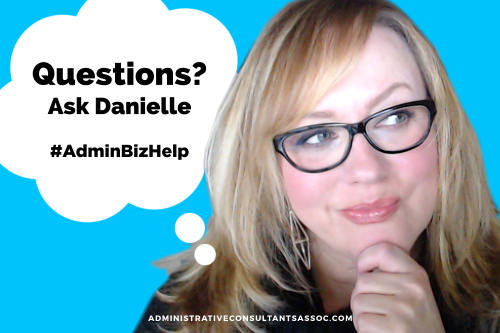 5 Comments Posted in Administrative Consultants, Best Communication Policies, Dear Danielle, How to Say It, Naming Your Business, Virtual Assistants, What's In a Name, Why We Stopped Calling Ourselves Virtual Assistants, You Are NOT an Assistant. Bookmark the permalink. Thank you very much for the explanation of the term/title “Administrative Consultant”. I can/will use your explanation when talking about my business and what I do. This is why we connected Danielle. I had an immediate aversion to both terms, as you say they are misleading and irrelevant respectively. You were the only one who struck a cord with me! Thanks for sharing our ‘chat’ Danielle … I really hope it helps other people struggling with “who” they are! I personally have always struggled with it (there’s that analysis paralysis again LOL), but now feel a lot more comfortable with the terminology! Great topic of discussion. I am little more enlightened than before.